Ownership / Access: Napier University. 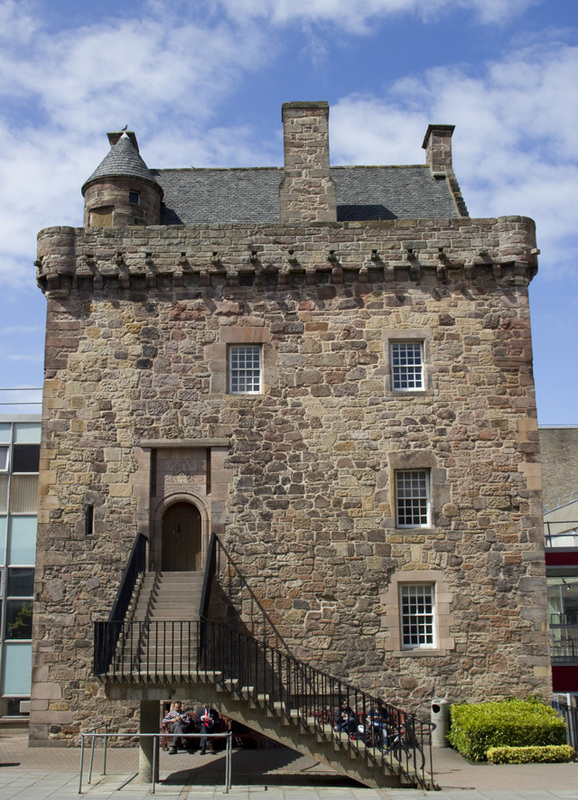 Notes: Merchiston Castle or Merchiston Tower was probably built by Alexander Napier, the second Laird of Merchiston around 1454. It serves as the seat for Clan Napier. It is perhaps most notable for being the home of John Napier, the 8th Laird of Merchiston, inventor of logarithms who was born there in 1550. The Tower is an interesting and elaborate example of the medieval tower house, being built on the familiar "L" plan with a wing projecting to the north. It was originally vaulted at the second floor and the roof. Among several remarkable features is the unusual elaboration of the main entrance, which is at second floor level in the south front. The tall shallow recess in which the doorway is set undoubtedly housed a drawbridge which must have rested upon an outwork some 14 feet above ground level and 10 feet from the Tower. Shortly after being let to Merchiston Castle School it was considerably altered with the addition of a castellated Gothic-style two-story extension and a basement, which has since been removed. Napier University has taken out large sections of wall on the northern extension to accommodate a corridor which runs through the Castle to other campus buildings.